Scrape the frosting off of the oreo sandwiches. Place the cookies, sugar, salt, and melted butter into a food processor and blend until completely combined. Butter a 9 1/2 inch spring form mold and pack the crumbs in, working from the center out to the edges and up the sides. Place in the freezer to cool while we work on the surprisingly easy cheesecake filling. Let the cream cheese come up to room temperature. Beat for a minute to loosen up the block shape. Add sugar, salt, flour, and lemon zest, and beat for one minute more. Add the eggs and egg yolks one at a time, beating each one completely before adding the next ones. Add vanilla extract and combine with a spatula. Preheat the oven to 500F. Fill the Oreo crumb shell with the cheesecake filling (minus that amount which you will save for "testing"), and bake for 10-15 minutes, or until the top is lightly browned. Once the top is golden and puffed, without opening the oven door, turn the oven temperature down to 200F and bake for one hour more. Let it cool on the countertop before returning to the refrigerator to cool completely. Let it cool for at least 2 hours, but preferably overnight. In a medium saucepan, add strawberries, blueberries, lemon juice, sugar, cornstarch, water, and salt. Maintain a boil for 2 minutes and turn off the heat. Cool the Very Berry topping in the fridge as well. 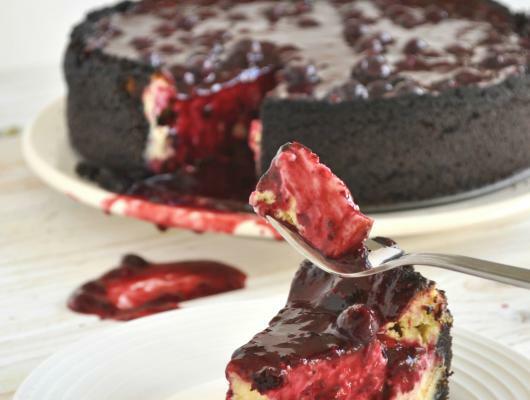 After a minimum of two hours, preferably overnight, pour the Very Berry topping over the cheesecake, slice large, and serve with a dollop of whipped cream. This luxuriously dense N.Y. 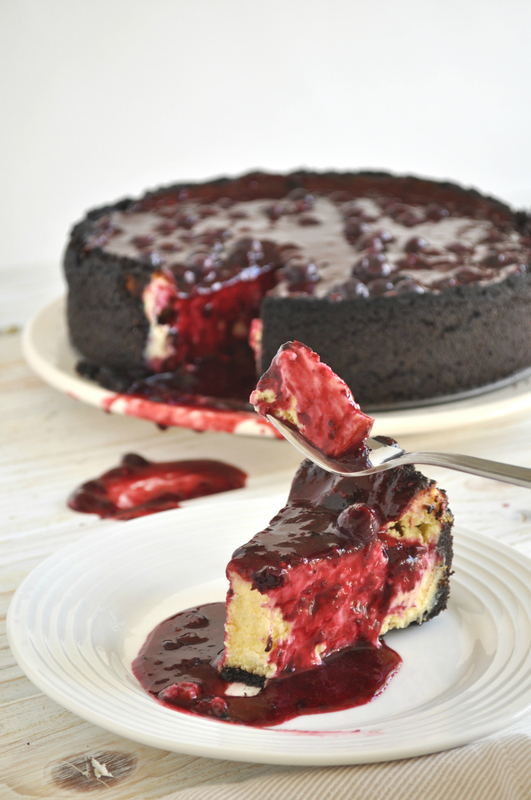 Cheesecake is topped with a very berry compote and nestled in an ultra dark chocolate crumb. You won't be able to resist it!